OMG, I loved Merlin! I saw the 1st two episodes on Hulu yesterday with my mother. She has a BA in English and she focused on Shakespeare and Arthurian literature, so she enjoyed the series. I can't wait to see more. Oooh, last I heard Privileged was coming back. Too bad, I really like Joanna Garcia. Good thing I'll be able to see her on Gossip Girl! I thought Merlin was pretty darn good :) I'll keep watching it for sure. It could be better though..
Johnny Depp does look super freaky in that getup. The first time I saw it, I thought I was imagining things. I love Alice in Wonderland, and I have to see it, so I'll be joining you in the nightmares. I can't wait for the new Alice! I love the vivid colors Tim Burton brings to the screen. But you're right. He's a little creepy. I'm a die hard Team Jacob and love the new cover. Merlin? Really. I hadn't heard. I may have to check this out. Oh yes, freaky photos but I LOVE it. I can't wait, I'm a huge Johnny Depp fan. And him with Tim burton is always fun. So going to check out the Merlin show right now. Thanks for the news! Wow, I thought I was the only one excited about the Merlin series. And until you mentioned Edward in the moon, I hadn't even noticed him there. I'm so glad to see Joanna Garcia on TV again. I really enjoyed Privileged and was sad to see it canceled. 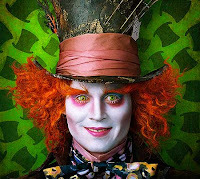 2) Johnny Depp= totally creepy in Alice in Wonderland. I can't wait! I am SO EXCITED for Alice in Wonderland. It's my favorite book of all time and I love Tim Burton! What better combination could you get? I am beyond pumped to see Alice in Wonderland. I let out a squeal when I first saw those pictures, Tim Burton and Johnny are an awesome team. I've never watched Merlin, but this week it's all I've been hearing about, so I'm taking it as a sign. The only thing Breaking Dawn did for me was make me like Jacob. But with Taylor, yea, I'm liking Jacob a lot more these days. You're freaked out by the Alice in Wonderland pictures? Dude, I am super psyched for this movie! I've been super psyched ever since I've heard about it, I am a HUGE Tim Burton and Johnny Depp fan! I actually thought that this was kinda funny at first because for a while, for drama class, I was playing the Mad Hatter. I've never actually seen the original or read the book, but still pumped up for the remake! I have been so ready for Alice in Wonderland since I saw the pic of Depp months ago, but after seeing the rest of the pics I am even more excited. I also read today on EW.com that as soon as Tim is done with his work on Alice then they (meaning him and Johnny) are FINALLY going to start on the movie for Dark Shadows! YaY. Depp is going play the creepy vampire Barabus Collins. Oh, Giles...how I miss him!